Success can come in small packages or sometimes in small bottles filled with smelly liquids. The garlic concentrate diluted with water (one part concentrate to three parts water) has been effective in deterring those pesky Japanese beetles from completely denuding the grape vines. Most of the damaged leaves have been removed and, with luck, the plants will push new growth before the end of the season. Score one for our side! Hand picking the harlequin beetles off of the curly kale seems to be keeping those critters in check. The plants are looking quite perky for this point in the season. The cucumber harvest is well under way. We planted 'Pickle Bush' hybrid along two small trellises back in May. The resulting plants are flowering well and have produced enough cukes to make a batch or two of bread and butter pickles. A later planting of 'Marketmore 97' cucumbers are almost a foot high and should provide us with even more crunchy additions to late summer and early fall salads. The dozen or so different types of beans are now in their glory. The long, red Chinese noodle beans climbing high on their tepee supports look wonderful at the back of the garden. The various shelling bean plants -- Calypso, Great Northern, Black Turtle -- are filled with pods, ready for picking. 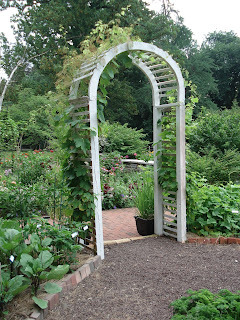 The string beans including 'Soleil', 'Masai' and 'Kentucky Wonder' are in flower. What a wealth of delicious eating awaits! 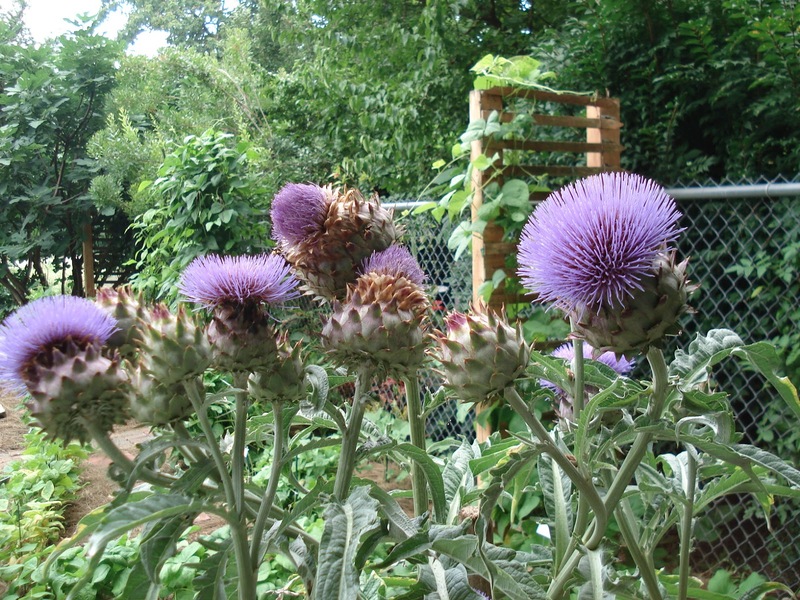 The cardoons are in full bloom at the moment. 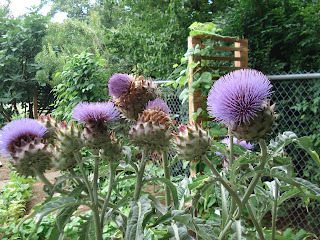 Their thistle-like flowers are bold and beautiful. It is worth considering planting this perennial for its ornamental qualities alone. Come visit us in the garden soon! We love company!